LEN - www.lankaenews.com | Parliamentary gen. secretary paid Rs 100 million as bribe by MARA –SIRA junta! Abides by president’s crazy orders ignoring speaker’s legal directives therefore ! 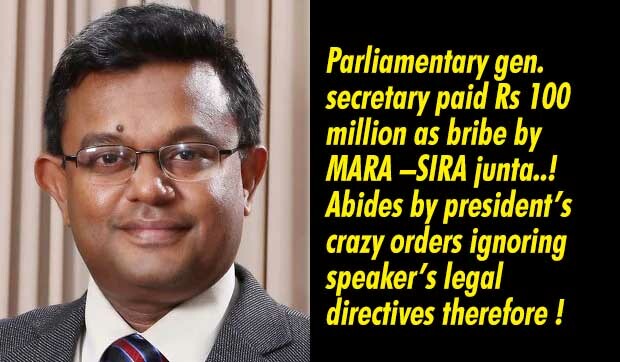 Parliamentary gen. secretary paid Rs 100 million as bribe by MARA –SIRA junta! Abides by president’s crazy orders ignoring speaker’s legal directives therefore ! According to Dhammika, based on the gazette notification ( illegal) issued by the president to re convene parliament on the 14 th ,any other order to convene parliament before that date cannot be accepted. Both the deputy secretary and assistant secretary are ignoring the legal directives of the speaker .. Therefore convening parliament by the secretaries on the 5th and Dinesh Gunawardena assuming duties as the speaker is unlawful. Even if the president is taking the law into his hands and issuing illegal gazette notification , but if those are against the law , the government officials cannot abide by those directives because some day they are going to be hauled up before the law. That is unavoidable. May we recall the funds amounting to Rs. 62 million that was granted by UNDP in 2007 for the refurbishment of the parliament were misappropriated by him. .The chairman of the Parliament refurbishment committee was Dhammika Dissanayake.Dhammika called for tenders for the purchase of computers .Metropolitan Co. submitted a bid for Rs.18 million. Dhammika however for obvious reasons cancelled that tender, and called for bids again two months later. Metropolitan in accordance with same specification submitted a bid for Rs. 80 million, which was unbelievably for inscrutable reasons approved by Dhammika. Following this Rs. 62 million fraud , Priyani Wijesekera the then Parliamentary secretary lodged a complaint with the Bribery and Corruption Commission. At that time it was claimed the Bribery Commission cannot investigate the murky goings on within Parliament , whereby Dhammika went scot free. Subsequently , the Auditor General conducted an investigation , and found Dhammika guilty. Meanwhile Priyani went on retirement , and as always the Rajapakse regime appointed the same crook Dhammika again as Parliamentary gen. secretary. Thereafter the racket involving Rs. 62 million was swept under the carpet. Dhammika also is a famous scrooge . After collecting state funds when he does official tours abroad instead of staying in hotels , he makes bogus claims and collects state funds after lodging in temples. Such a corrupt scrooge is Dhammika.